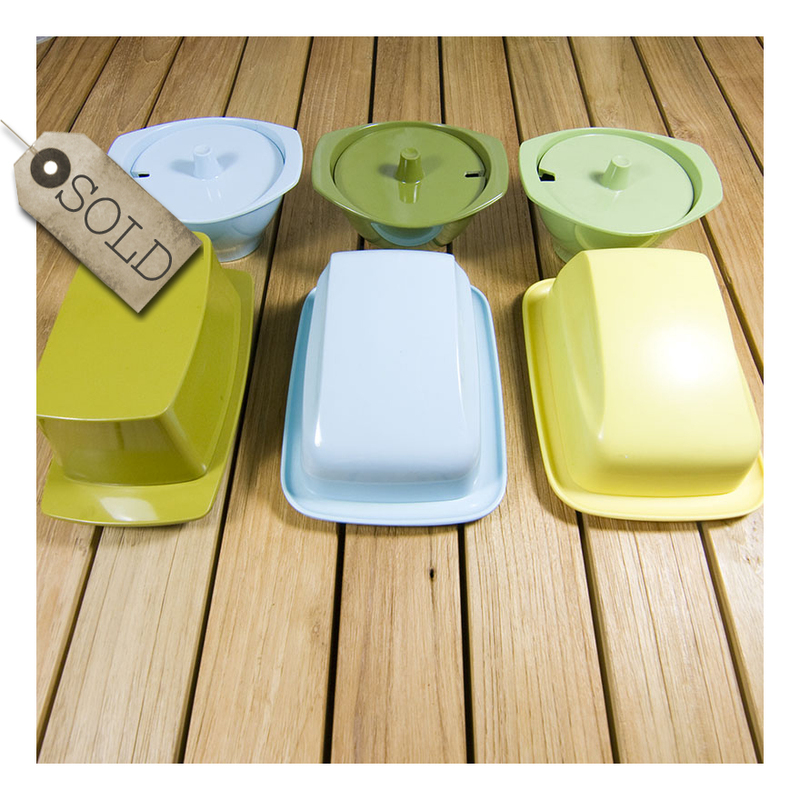 I have posted 70s melamine ware previously- I am drawn to the colours and forms of these beautifully designed pieces. I collect two Australian manufacturers- Bessemer and Vogue. Bessemer products – made from melamine – were made by the Nylex Melmac Corporation which started production in the mid 60s. This beautiful platter [and the subject of previous posts, I have collected a lot of Bessemer!] was designed by Lionel Suttie, an industrial designer. It’s interesting that Mr Suttie is remembered as Bessemer’s lead designer: this was the first time that tableware made from plastic [melamine] was thought to be worthy of design – with an illustrative art statement. The platter certainly pays homage to late mid-century modernist design in its colours and abstract forms. While Bessemer led the way, employing an industrial designer to design tableware, Vogue followed suit. ‘Vogue Australia’ is imprinted on the bottom of these jugs; since the manufacturer name Vogue was also used in North America, at about the same time. 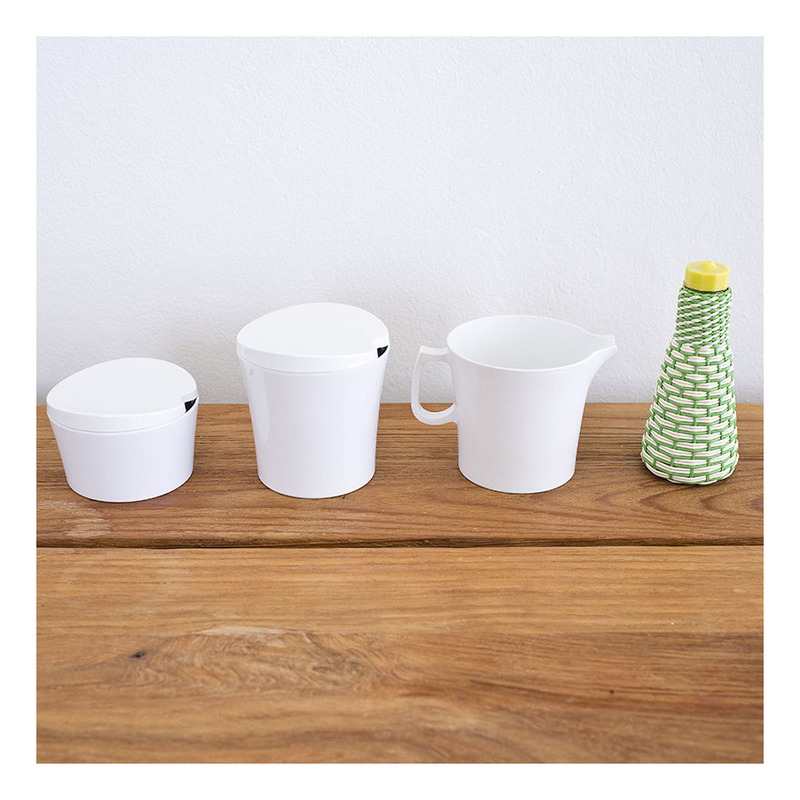 The platter and jugs can be used as intended- melamine is a strong plastic resistant to scratching and these pieces are ‘as new’ – or they can form part of a funky 70s display. 70s melamine is totally collectable. Altogether a fine homage to the 70s -and- 70s designers. This is Pyrex at its best- a jug modelled on a laboratory flask with an ‘atomic’ sunburst pattern in gold. The stopper is graduated plastic, in good old yellow plastic. 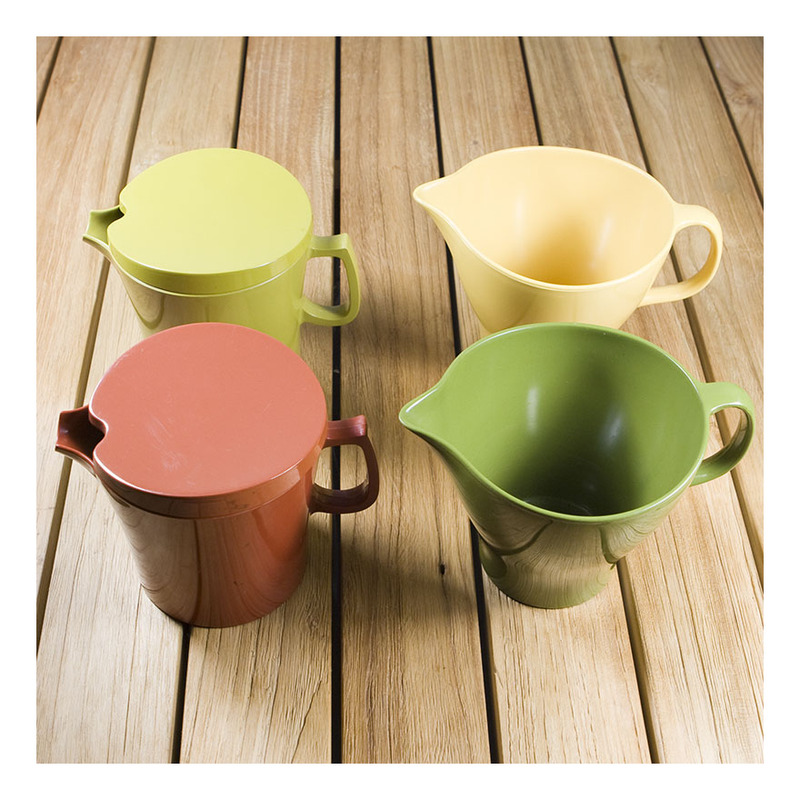 The jug has a pouring lip, two litre capacity and being Pyrex, is good for hot and cold liquids. Pyrex is very collectible – and the jug is in excellent condition. And –it makes a terrific vase when it’s not serving hot and cold liquids. The Bessemer plate is likewise very collectable. It is one of a series of six, designed by A. Wiederkehr – and is culturalyl important enough to be in the Powerhouse Museum collection. I would have loved to have collected all six- but alas- after so long hunting I have only found this one ‘in the wild’ [as collectors say.] I have found plenty of plates, of all the patterns – but they are invariably so scratched from use that I rejected purchasing. If you are a Pyrex collector [and there are quite a few!] 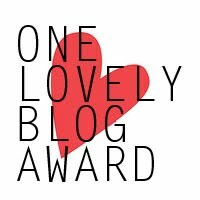 or a Bessemer collector, please check out the other items on my blog. I am a big fan of early 60s industrial designers – and Pyrex and Bessemer tick all the boxes! 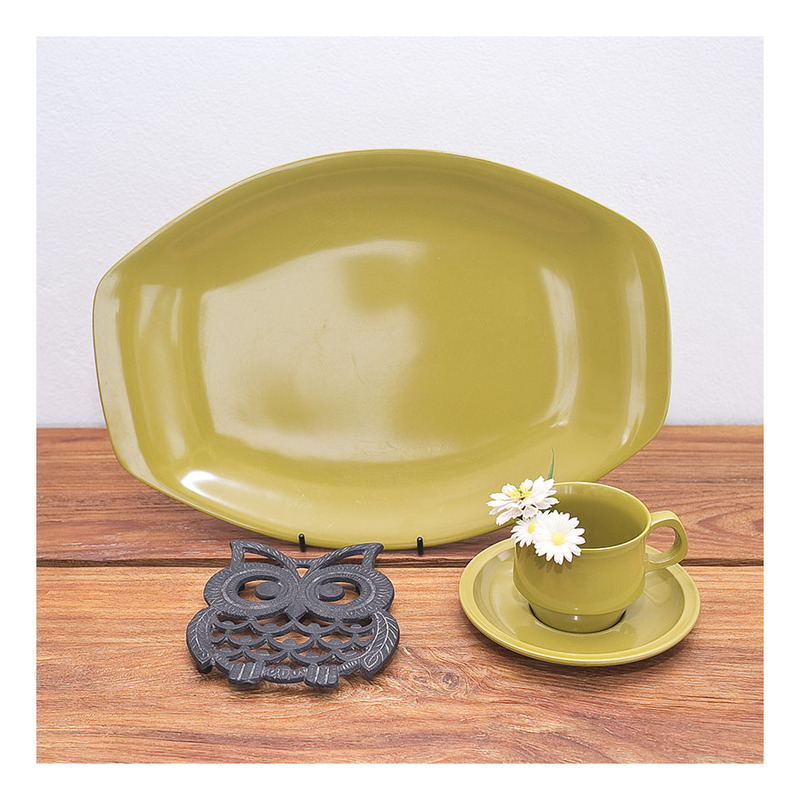 Bessemer ‘avocado’ ware is very collectible- here we have a platter and cup and saucer. Avocado refers to the particular shade of 70s green; this colour is rarely seen nowadays and is so heavily associated with the 70s. Owls too- in all their forms- are highly collectible. This is a must-have for any owl collector; a wrought iron trivet for the kitchen. 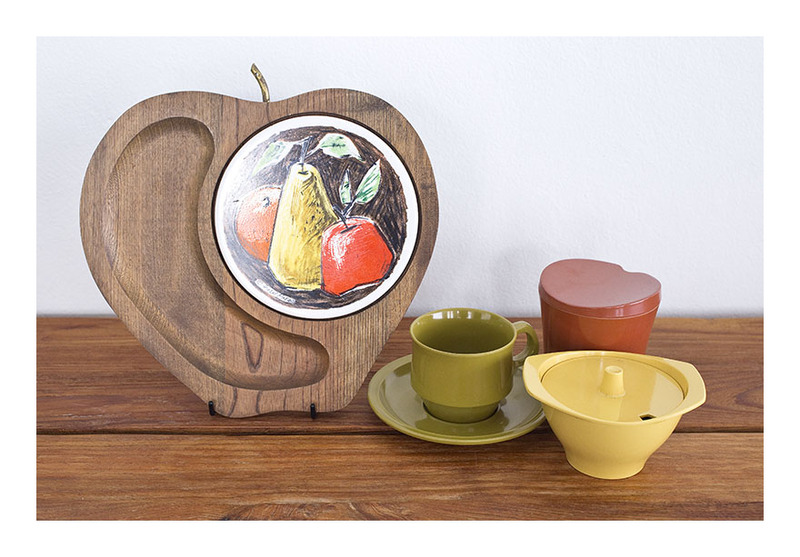 Highly stylised in that quintessential 70s way, the trivet has little rubber feet to lift it from the work surface, and it is simply marked ‘Taiwan’ with no other makers’ mark. I have waxed lyrical about Bessemer products in previous posts– made from melamine, they were made by the Nylex Melmac Corporation which started production in the mid 60s. These salt and pepper shakers and the double egg-cup were designed by Lionel Suttie, an industrial designer. It’s interesting that Mr Suttie is remembered as Bessemer’s lead designer: this was the first time that condiment or tableware made from plastic [melamine] was thought to be worthy of design – that a humble mass-produced domestic item could make a design statement. This set certainly does that- they pay homage to mid-century modernist design and in the colouring, homage to the 70s. 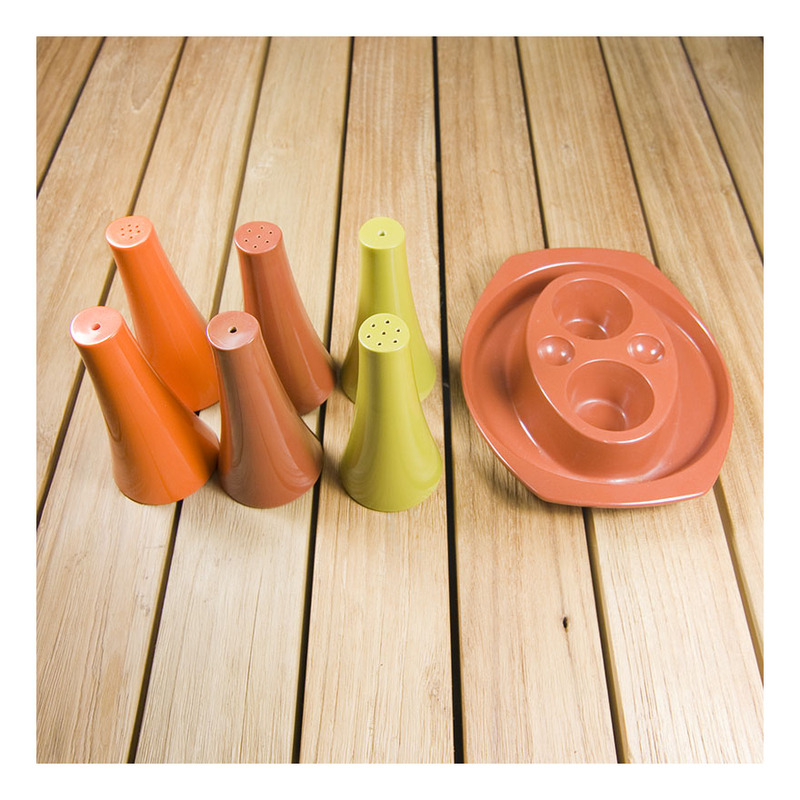 The salt and pepper sets are [l to r] orange, russet-brown and chartreuse. The double egg-cup is matches the russet-brown salt & pepper set…although you can see it has it’ own little indentations either side of the egg-cups which house it’s own salt and pepper. Start your Bessemer collection today…or add to your existing Bessemer collection…or better yet- use these funky pieces as part of your retro breakfast display! Here are some more Bessemer wares, further to my post below [where I admitted to having a little bit of a Bessemer collection.] These dishes and bowls came in yellow, green, blue, orange and russet brown [that ‘70s’ brown] so along with plates and cups and saucers, you could mix and match your tableware. Bessemer is now quite collectible, and I have seen some incredible prices on them in ‘antique’ shops. I’m not sure I can come at the idea of retro collectibles being antiques, but clearly others can. Bessemer rates a mention in Adrian Franklin’s Retro: A Guide to the mid-20th Century Design Revival [2011, NewSouth Publishing] which my lovely friends J & L gave to me for my birthday- a fantastic resource, reference and source of eye-candy. Thanks J & L!